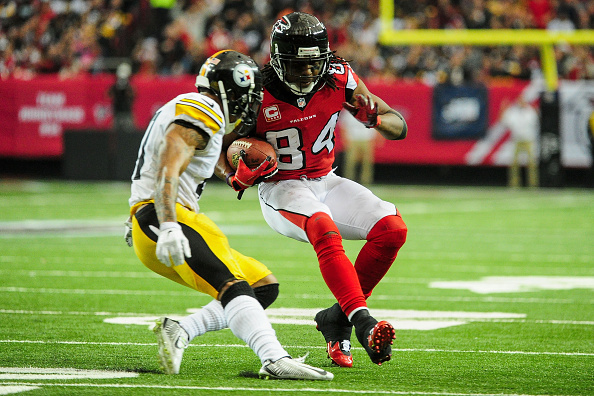 The Falcons inability to beat a team outside the NFC South reared its ugly head again Sunday, as it was more like a Steelers home game as Pittsburgh beat Atlanta 27-20. The Falcons (5-9) slipped out of first place in the abysmal NFC South and ensured themselves a second straight losing season. But Atlanta can still make the playoffs by winning its final two games against division rivals New Orleans and Carolina. Matt Ryan kept the Falcons in the game with a TD pass to Roddy White that cut the Steelers lead to 27-20 early in the fourth quarter. They got the ball back, but gave it up after they were unable to get a first down, and the Steelers ran the clock out after a gutsy third-down call in which they ran a play action that got them the clinching first down. Steelers QB Ben Roethlisberger threw for 360 yards, and Pittsburgh CB William Gay scored off an interception return for the Steelers (9-5), who remained a half-game behind Cincinnati in the AFC North with their second straight win. For the Falcons, if they are going to find a way to the postseason, they are going to need to do something they seem to have a decent job doing, beating teams in their division. Pittsburgh led 13-0 after Gay picked off Ryan’s pass over the middle on the first play of the second quarter, returning it for a 52-yard TD. The Steelers extended the lead to 27-13 with Le’Veon Bell’s second touchdown, a 13-yard run in the opening minute of the fourth period. The Falcons made a game of it, pulling within a touchdown on Ryan’s 4-yard pass to White. But the Steelers wrapped up the victory by running the final 4:34 off the clock. They converted twice on third down, the clincher coming when Roethlisberger found Miller all alone for a 25-yard completion on third-and-1 from the Atlanta 39. The Falcons didn’t have Julio Jones, but Harry Douglas had 10 catches for a season-high 131 yards.